Really. Someone needs to double check the chemistry here, but it looks like if you built a fire on Titan (Saturn's moon) instead of smoke you'd get frozen selzer water! 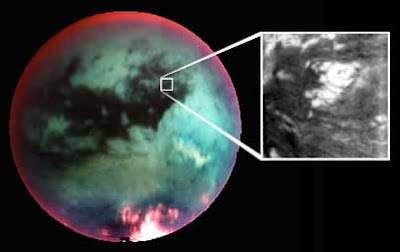 Until a recent Cassini flyby, haze on Titan prevented confirmation of predicted oceans and lakes. But in last week's Nature magazine scientists report definite evidence of lakes filled with liquid methane. But now consider this: when you burn methane (combine it with oxygen—also available in small quantities near the surface of Titan) you get CO2 and water. The surface temperature is about -180°C and CO2 sublimates at -78C so it would would be solid, and of course so would the water. Ta-rah, selzer water ice cubes. Any chemists out there that can confirm this?